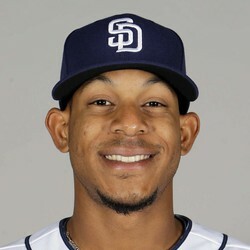 Jose Torres pitched two innings allowing two hits, one earned-run, one solo-home-run, and earning three strikeouts during Monday's 6-5 victory over the Milwaukee Brewers in extra-innings. Torres did exactly what he was supposed to do in the top of the ninth inning as a closer, retiring the side without allowing a run as the game was even at four runs. The Padres' hitters could not deliver any runs in the bottom of the ninth, and that led to trouble for Torres as Brewers' shortstop Eric Sogard approached the plate in the top of the tenth. On a one-and-one count, Torres delivered a 93.3 mile-per-hour fastball that was sent directly to deep right by Sogard for the go-ahead-run. Luckily for Torres, and the Padres, Hunter Renfroe would save the day in the bottom of the tenth with a walk-off home-run to secure victory at Petco Park. In a closer role, Torres is allowing too many earned-runs per innings-pitched to be trusted as a viable fantasy option at this time. He now holds a 2-2 record with a 5.00 earned-run-average to go along with a 0.94 WHIP and 23 strikeouts through 18 innings-pitched on the 2017 season. Torres is also one-for-two on save-opportunities through 19 appearances on the mound.